Four tour buses lined the streets near the Power and Light District, each painted with classic album covers and photographs. Their bright colors could be seen from blocks away, heralding the arrival of a six-string circus. Covered with images of Jimi Hendrix, there was little doubt what brought the caravan of nearly 20 musicians to the Midland Theater on Wednesday. The Experience Hendrix tribute clocked in at nearly three hours, or just slightly longer than the time it takes to play the three studio albums Hendrix released in his lifetime back-to-back-to-back. Hendrix’ army buddy and Band of Gypsy’s bass player Billy Cox opened the night and as expected the guitar pyrotechnics started almost immediately. Byron Bordeaux was the first to impress with his solo on “Machine Gun.” A terrific exchange between Dweezil Zappa and Indigenous axeman Mato Nanji on “Manic Depression” was another early high point. Eric Johnson’s six-song mini-set was the music equivalent of driving with hands firmly planted at 10 and two on the steering wheel and keeping the needle glued to 55. Johnson’s thin, reedy voice was incapable of creating any energy, a trait especially missed on “Power of Soul.” While technically proficient, Johnson’s fretwork also failed to capture the freedom and spontaneity that underlined Hendrix’ work. Robert Randolph’s segment nailed the other end of the spectrum. The pedal steel stylist had the crowd dancing for all of his set. Randolph was accompanied by the Slide Brothers, and hearing “Purple Haze” performed by three pedal steel guitars placed the classic number in a new context. When bass player/vocalist Henri Brown tried to wrap up “Them Changes,” a tribute to Gypsys drummer Buddy Miles, Randolph kept on playing, eventually leading the ensemble into a gospel romp. 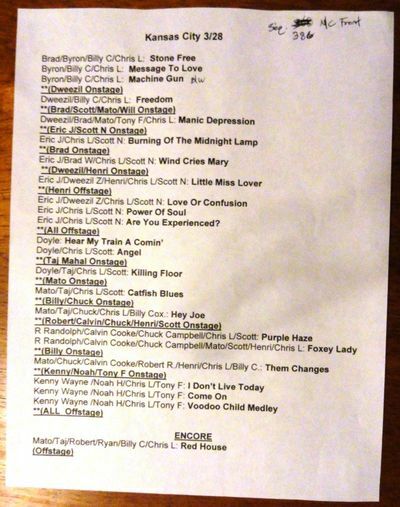 The lineup for Tuesday’s Experience Hendrix concert at the Uptown Theater seemed to set up a joke: How many guitarists does it take to pay tribute to the most celebrated axeman of all time? The answer: Fourteen, including half of Los Lobos, all of Living Colour, a pair of virtuosos, a handful of bluesmen and several contemporaries. 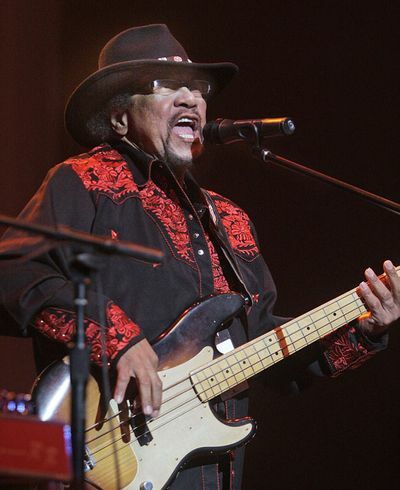 Bass player Billy Cox met Jimi Hendrix while the two were in the Army. He is the last living musician from any of the bands Hendrix lead. Billy Cox, the Band of Gypsys bass player and Jimi Hendrix’ last living band mate, opened the night with a heartfelt thank you and romp through “Stone Free.” Backing him on drums was Chris Layton, better known for his time backing Stevie Ray Vaughan in Double Trouble, and Ernie Isley of the Isley Brothers. The star-power of the opening lineup may have had the loaded house drooling over their guitar magazines, but they didn’t have long to revel. Every 20 minutes or so, another pairing of musicians emerged, each seeming to emphasize a different aspect of Hendrix’ music. His rhythm and blues roots came out in Living Colour’s set, while members of Los Lobos paid tribute to his roots and Kenny Wayne Shepherd emphasized the rock star angle. Jonny Lang’s performance of “Fire” was the first explosive moment of the night. Backed by Brad Whitford of Aerosmith and a vivacious chorus of singers, Lang’s feverish vocals and impassioned playing drove the crowd to their feet. Whitford was finally able to emerge from the long shadow of his Aerosmith band mate Joe Perry as he and Lang traded solos. Lang’s set was followed by Kenny Wayne Shepherd’s explosive interpretation of “Voodoo Child (Slight Return).” Knowing his boss was about to burn down the fret board, singer Noah Hunt, who also sings in the Kenny Wayne Shepherd Band, abandoned the stage after completing his verses. Alone onstage, save the rhythm section of Layton and Scott Nelson, Shepherd struck about every rock star pose imaginable as he soloed endlessly to the rapture of the crowd. Susan Tedeschi was the lone intruder into this guy’s night out. Although she wasn’t given a set of her own, each of her frequent guest appearances was inspiring. Her singing on “One Rainy Wish” added an earthy sensuality and vulnerability to Hendrix’ lyrics, and her tasty guitar solos were a welcome relief from the pyrotechnics. Midway through the set, guitarist emeritus Hubert Sumlin emerged to represent the pre-Hendrix guitar world. Backed by Tedeschi, and Cesar Rosas and David Hildago of Los Lobos, Sumlin showed none of his 78 years powering through “Killing Floor,” a song he originally cut with Howlin’ Wolf for Chess Records in 1966. While all the expected heavy hitters drew big responses, some of the evening’s best moments occurred during songs Hendrix didn’t write. Robert Randolph and Sacred Steel teamed with Cox and Living Colour singer Corey Glover for a jubilant gallop through Buddy Miles’ “Them Changes.” Cox tried to end the number, but Randolph wouldn’t let it stop, motivating Glover’s fervent yelps with his riffs. Early in the night, Isley’s unaccompanied incorporation of “Amazing Grace,” mostly played with his teeth, brought back shades of Woodstock. After every trick and novelty had been exhausted, Cox returned to the stage and closed the night with the blues staple “Red House.” When all the performers were brought out for a final bow, they extended nearly all the way across the stage. Evidently it takes a lot of bodies to fill some very big shoes. Note: Except when replaced by Living Colour or Billy Cox, Chris Layton and Scott Nelson played drums and bass. The Sacred Steel is Robert Randolph, Darick Campbell and Aubrey Ghent. Living Colour is Will Calhoun, Corey Glover, Vernon Reid and Doug Wimbish.